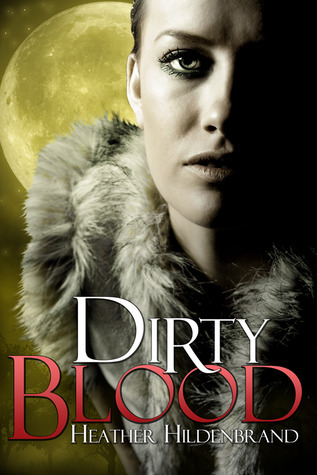 It is funny to consider an urban fantasy to be “charming” but that is just what Dirty Blood is – blood, guts, gore, murder and all. Without looking up how it is placed on the genre ladder, I would say that this qualifies as young adult, or new adult, but I found it extremely readable as an adult urban fantasy novel as well. Tara is 17-years-old, but she seems more mature, while still throwing the occasional temper tantrum. Of course, if I were her, I would have thrown a fit and fallen down in it at the way she is treated by those around her. This is a very fast paced read. Tara is thrown into the metaphorical deep end of the pool, left to struggle to learn to fight and kill with the help of member of “The Cause” a group of Hunters and Werewolves who are trying to stop the fighting between the breeds – to create peace from the ashes of war. It is a lot for a 17-year-old to take in – especially when her mother is determined to bury her head in the sand and pretend that Tara can simply spend her life on the run, hiding from those who would kill her. Or would use her for their own ends. For Tara is something more than a Hunter, and what she is puts her at odds with both sides. Overall, I would recommend this for any UF fan, male or female. I don’t normally care for YA and all the attendant ‘sturm und drang’ but this is not your typical YA. Tara is a great hero – she is strong and brave while still showing her lack of training and the shock and fear that such a tremendous change to her life, along with her fear for the safety of those she loves engenders. Of course, my favorite part of the book is during “the” big battle scene (there are several in the book) when her grandmother walks into a building full of warring Wolves and Hunters and commences to staking Wolves as if she is picking daisies. Awesome. I received this book from the publisher in return for a realistic review. All thoughts are my own. The next book in the series is Cold Blood. Tara has been shipped off to Hunter Boarding School, where she will be safe and cozy and well-trained. Well, the well-trained thing might happen. The rest of it? Well, that is highly doubtful…. Scranton, Pennsylvania fifty years after WWII is a different place than one might expect. When millions of Americans poured into Europe to fight in the war, they picked up a little something extra to bring back home besides war wives and interesting STD’s. Quaint little things like cases of werewolves and vampires and zombies (oh, my!) Needless to say, it changed the way life is lived in the good ol’ US of A. Instead of McCarthy going after ‘Commies’ he gets to do real, honest-to-goodness witch hunts – for real witches. . . I listened to the book – the Audible edition. As much as I enjoyed Gustainis’ work, I cannot say the same for the narrator. He was, in a word, completely irritating. What narrator worth his salt cannot be bothered to check pronunciations?!?! The guy STINKS at pronunciation! Come on – you don’t know how to pronounce “were” as in “werewolf? ?” Weer (like a Bostonian we’re) is not even close to correct, Peter. It is rather insulting to the author that you can’t be bothered to take a moment to learn pronunciations. Especially for such common terms. Overall, I knocked a full star off for poor narration. Another half star for some problems with trite characterizations (especially the handling of Markowski’s first partner) and with his tendency to treat his characters with something less than respect. Overall, however, this was a completely bad introduction to the series. I hope to find a more well rounded volume with the next in the series, Evil Dark: Occult Crimes Unit Investigations, Book 2 – though I won’t be buying the Audible edition. Five more minutes of Peter Brooke and I may have been forced to throw my reader across the room. . .